The US Census Bureau publishes data on international trade for each of the 50 US states and Washington, DC. 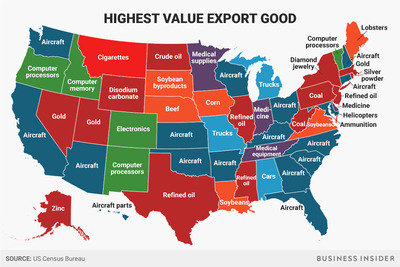 Business Insider took a look at the biggest export good from each state, based on total 2016 dollar value. International trade is a big part of the US economy, and of the individual state economies that together make up the larger whole. 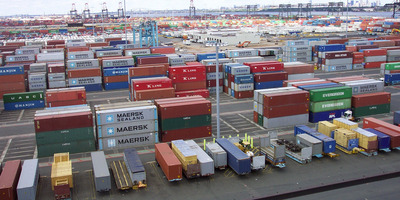 The US Census Bureau publishes data on international trade for each of the 50 states and Washington, DC, including lists of the top-25 exported goods from each state by dollar value. Based on that, Business Insider took a look at the highest-volume export good from each state, based on total 2016 dollar value. Exports of aircraft and aircraft parts were the most common category, with 17 states having their biggest export coming from that group. It’s worth noting the Census data include only trade in physical goods: The US economy is predominantly a service economy, and international trade in services – like an architecture firm based in Chicago designing a building in the UK, or a financial advisor on Wall Street managing a retirement account for a resident of Japan – are not included in this particular data set.